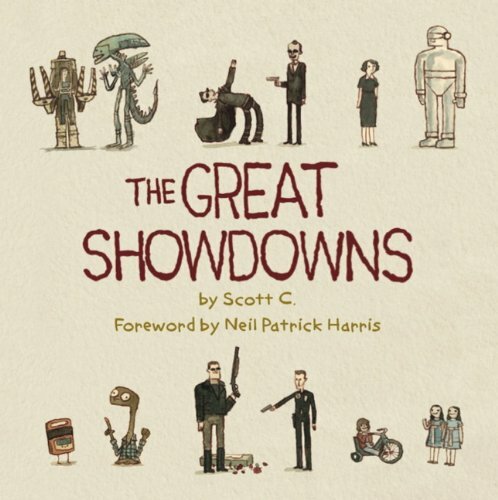 The Great Showdowns is a collection of pop culture illustration book from Scott Campbell. Each page depicts a particular film where the characters would face off each other. These are watercolour illustrations that Scott Campbell post occasionally on his website. If you're a movie fan, then you can challenge yourself to guessing which films the characters are from. I can't make out half of the illustrations, and there aren't any answers. It's not easy. The drawings are cute, whimsical, very characteristic of Scott Campbell. I used to think they are just watercolours, basically ink and wash. Well, they are actually more complicated to create, as revealed in one of his blog posts. The book is about palm size, hardcover with 144 pages. And if you haven't, also check out his earlier artbook Amazing Everything.